Mention the words RSV4 to any motorcycle enthusiast and he or she will immediately turn their attention to you. This is because of Aprilia’s very successful litre-class superbike. As the name would suggest, the RSV4 is powered by a 65degree V4 powerplant which produces an abundance of power, 180hp to be exact, and a fantastic noise which emanates through any pit lane or garage. The V4 design also allows for an incredibly compact machine which in turn makes the RSV4 nimble and very easy to ride. The R model differs from the factory model in a few areas. For starters, the carbon fibre is replaced with standard plastic, the forged magnesium wheels are replaced with standard aluminium wheels, the Ohlins suspension is replaced with a more conventional Showa fork and Sachs shock. The frame is also not adjustable unlike the Factory, however there are some advantages as I shall explain. Although the weight is approximately 5kg up on the factory model, Aprilia have still kept the best attributes on the R version, namely the V four powerplant, 3 riding modes, ride-by-wire, a race bred chassis and dual injectors. In addition to this, the price of the R is a lot less damaging than the Factory. Besides only a few riders will make the most out of the Factory trick bits, for the rest of us the R is almost a near perfect blend. Open the throttle and the V4 comes alive and propels you down the road whilst picking up speed at an incredible rate. 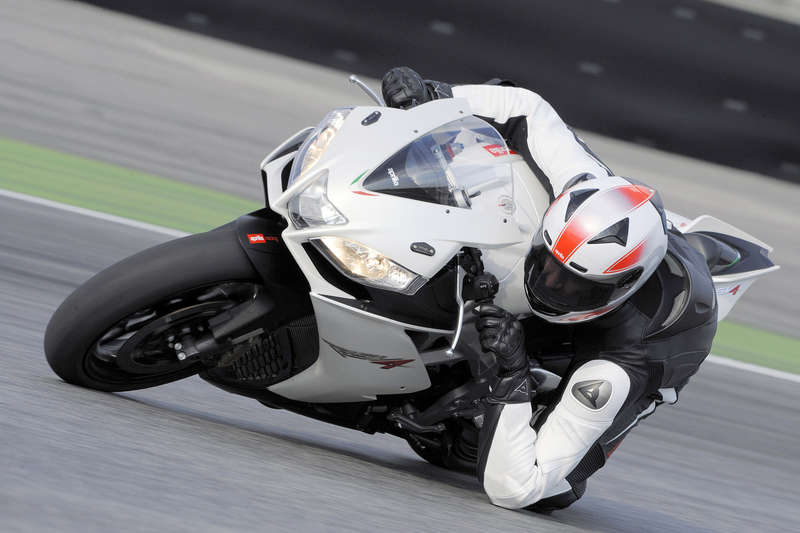 The V4 produces a symphony of noise, unlike most traditional superbikes which scream, the RSV4 growls. When you have decided it’s time to apply the anchors, you will be glad to know they are supplied by Brembo and are fantastic. Max Biaggi has achieved incredible success on board his RSV4 in the superbike world championship, helping Aprilia re-establish themselves as a serious contender for the best Superbike machine. If it wasn’t for the insane HP4 or beautiful Panigale, the RSV4 would probably be top of the pops, but don’t forget the RSV4 has been around longer than both the aforementioned models. The words edgy and aggressive sum up the RSV4 perfectly, however the R provides a good level of control and stability as well. If you’re in the market for a superbike that possesses a gorgeous Italian design, produces a unique sound and can charge down almost any superbike, then this is the bike for you.